It’s time for another episode of our Workout Central series! Today I’m going to share a simple workout that I did a couple times during our vacation on Marco Island, Fla., last week. The beauty of this workout is that it really gets you going (I probably sweated a bucket!) while not requiring any specific gym equipment, so it can be done anywhere, anytime, even when you’re on vacation! This time around, I got brave enough to demonstrate the workout myself. I originally wanted to ask my husband to take the pictures by the poolside of the house we were staying in during the vacation – that would have been pretty cool, but life interfered, and we never got to do that. Instead, I’m demonstrating the moves at our local gym back home in these pictures. To see other workouts in the Workout Central series, click here. Repeat the exercises below in the listed order, starting at 11 repetitions (reps) of each, with no more than a 5-second rest between each exercise. 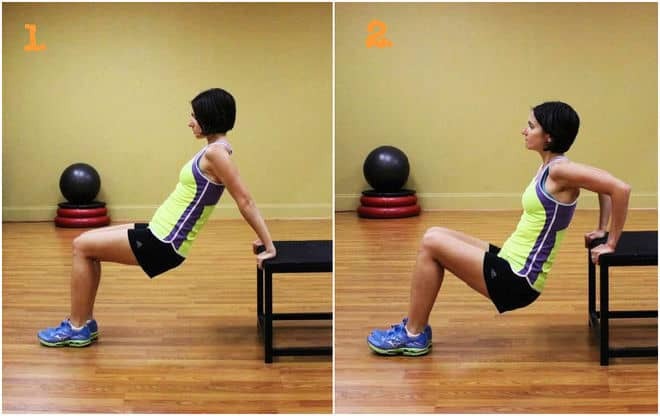 After completing the sequence, rest for 30-60 seconds, then repeat everything with 12 reps for each exercise; the next round – 13 reps, then 14, and finish with a final round of 15 reps for each exercise. This workout can be done at home, at the gym, outside on the grass in the park, etc. You’ll need a couch, a park bench, or any kind of steps/stairs to perform split squats and tricep dips. Make it harder: Instead of doing 11 thru 15 reps for each round, do 16 thru 20. From a standing position, drop into a squat and place your hands on the ground (see 1 below). 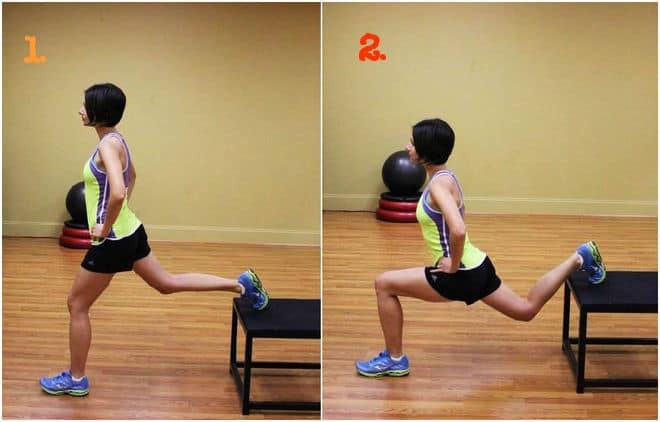 Kick your feet back while your hands remain in the same place as in the beginning (2); immediately return your feet into the squat position, and jump up (3). That’s one burpee. Lower impact burpee: Skip the jumping part. In step 2, just extend each foot back one at a time, then return into a squat and stand up without a jump. Stand about 3 feet in front of a step, bench, or some other sturdy platform (it’s best if the platform can’t move accidentally). Put your right foot on top of the platform behind you (see 1 below). Bend both knees, lowering the right knee towards the ground, and bending the left knee until your left thigh is parallel to the ground (2). Push through the front heel to stand up. Perform all of the reps, then switch legs and do the exercise with the left leg on the platform. Place your hands and feet on the floor, with your hands slightly wider than your shoulders, keeping your body in a straight line from shoulders to feet (1). Keeping your midsection tight, lower your body to the floor until your elbows reach a 90-degree bend (2). Return to the starting position. Easier push ups: Lower on your knees in step 1, and follow the rest of the instructions. Sitting on the floor, bend your knees to about 90 degrees and lift them up; move your torso slightly back; hold your arms parallel to the ground (1). You might need to fight for balance a little bit – just remember to keep your back straight. Straighten your legs, move your torso back a little further to achieve a wider V (2). Return to the starting position. That’s one rep.
Make it easier: Put your hands on the floor to the both sides of your hips for more balance. From a standing position with your feet shoulder-width apart, bend your knees and move your hips back to lower into a squat, until your thighs are parallel to the ground or slightly lower than parallel (1). Important: keep your weight on your heels, and don’t let your knees move forward past your toes as you squat. To jump: roll your weight from your heels to your toes as you rise from the squatting position, and jump up. Land on your toes before rolling back on your heels. That’s one rep.
Make it easier: Jump squats may be a little advanced for some people, so if you don’t want to jump, you can do a dimple squat instead. Use a step or a platform like in the split squats above. Place your hands behind you on the platform slightly wider than your hips (1). The further away you step from the platform, the harder this exercise is going to be. Keeping elbows pointing back and close together, lower your hips towards the floor (2). Push yourself up and return to start. That’s one rep. Lying on the ground with your hands under the hip bones (for some cushioning) (1), lift your legs straight up until they reach a 90-degree angle with your body (2). Keep your abs contracted throughout the exercise, drawing your navel towards the spine. Lower the legs until they reach 2-3 inches from the ground; that’s one rep.
That’s one round; repeat 5 rounds, starting with 11 reps per round and adding one more rep until you reach 15. Or do 16 thru 20 reps if you’re feeling ambitious! That’s it for today’s vacation workout. Big thank you to my husband Rob for taking the pictures and staying patient despite my attempts to micromanage everything during the photoshoot! I’d love to hear your thoughts about this workout, so please let me know what you think in the comments! If you did this workout, please share how it went! If you liked this workout and would like to see more in the future, stay in touch with Vegan Runner Eats by subscribing in the top right corner of this post, or by following us on Facebook, Twitter, and Instagram! Disclaimer: Please check with your doctor or a medical professional before beginning any exercise routine. I am not a certified fitness trainer, and all workouts found on my blog are based only on my own experience. Tagged fitness, HIIT workout, Workout Central. Bookmark the permalink. Great post – I appreciate the info.